Teiji Furuhashi died on 29 October 1995 in Kyoto, Japan, of an AIDS related illness—he was 35 years old. I first met Teiji in Kyoto when I was researching the exhibition Zones of Love—contemporary art from Japan which toured Australasia 1991-92. Although he always denied that he was the leader of Dumb Type (or that there was any leader in the group), he was very much the public, internationalist face of the group and his energy was palpable even if his authority within Dumb Type was more covert. Dumb Type began, and continues, as a loose group of theorists, visual artists, architects and performers. Most met each other when they were students at Kyoto University. Bored by the contemporary scene of the early 1980s and the vacuousness of much of Japanese society, but energised by teachers such as artist Yasumasa Morimura and theorist Akira Asada, Teiji Furuhashi and Dumb Type began to make provocative installations and then performances which quickly propelled them onto the international stage. When I met Teiji in 1989 and watched the documentation of Dumb Type’s work I decided immediately that they would come to Australia and perform as part of Zones of Love. It is unusual to meet people who are so young, so organised and so specific about what they are doing—and Teiji was that. The work crossed media boundaries (video, film, performance, sound, architecture…) in highly innovative ways, and it addressed the contemporary condition of both Japan and the technological world in which we now live. Teiji never quite believed that I could achieve my aim of getting the group to Sydney because it was such an expensive project and because of the difficulty of raising money (the Japanese government was most reluctant to fund such work), but with a lot of help and two months to go, assistance was found and Dumb Type performed pH in Sydney at the MCA. This piece electrified the audience with its energy, technological expertise and enigmatic performance styles which presented a bleak and elegant view of contemporary life. And each night after the performance the members of the group would change into drag of one sort or another and go to perform in bars around the city as Julie Andrews or the OK Girls. These people knew how to party. 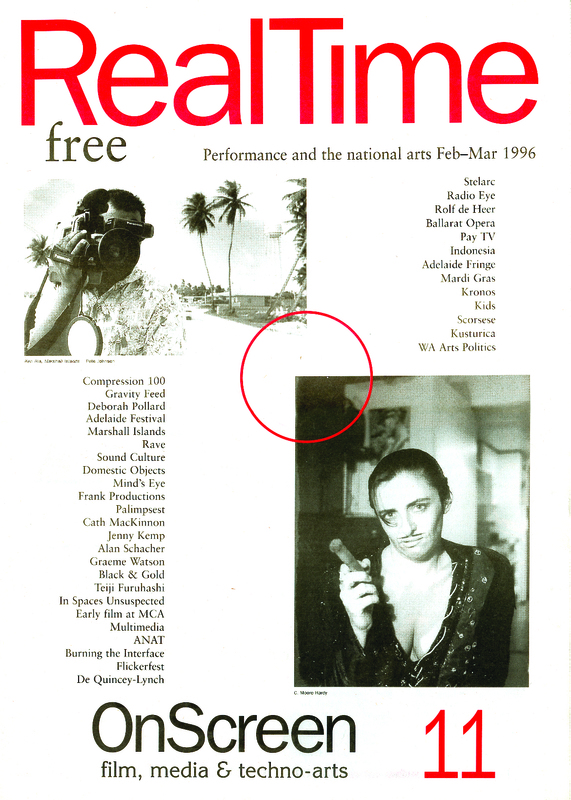 In 1994 Dumb Type returned to Australia and performed their new work S/N at the Adelaide Festival. S/N deals explicitly with sexual and racial difference in the Japanese context. For Teiji, this was a painful piece because it was about himself and his journey through one of the world’s most rigid and conservative societies as a homosexual and HIV+. Again after each performance the party would begin, and later in Sydney at Newtown and Oxford Street clubs the novel drag acts would utterly delight the audience. Over the last five years Teiji’s bouts of illness grew longer and it was with great regret that Dumb Type had to cancel a tour to Brazil during Mardi Gras in 1995. Teiji and the group returned to Kyoto from North America where his solo installation Lovers was being exhibited to much acclaim in New York and Toronto. Lovers is an homage to the artist’s friends and lovers, a complex and elegiac piece where Teiji and eight other performers become projections of light in a dark room—their actions mingling with words, sentences and the music for which Teiji was also renowned. Dumb Type will continue to tour S/N to Hong Kong, New Zealand and Europe through 1996. Lovers is currently touring France and thereafter other European venues until the end of this year. A new Dumb Type piece, Monkey Business, in collaboration with the Danish group Hotel Pro Forma (appearing at the 1996 Adelaide Festival in Orfeo) and New York architects Diller + Scofidio, will premiere next year. Most recently Teiji featured in the SBS documentary Hell Bento! !, and a compilation of Dumb Type’s music is available from Spiral Garden/Wacoal Art Center, Tokyo. Teiji was a perfectionist, an innovator and highly creative in whatever form he worked. His credo was “try harder”, and people always did. Judy Annear is Curator of Photography at the Art Gallery of New South Wales.